It's funny - I am totally a jeans type of person. I just feel the most comfortable wearing them. But, every once and awhile I gravitate towards a dress that I like. This floral dress was one of those dresses. I spotted it - and thought it was so fun that I wanted to style it. I love the way it turned out. Plus, that dress is a great deal. It is 40% off and only $60 (and not part of the NSALE). These fun striped pumps are marked down. This great wrap dress comes in three colors and is on sale! This is a jacket I would love to buy. I like these white sneakers that are 10% off. This striped tank dress is 40% off. I really want to buy these pants! This comfy sweatshirt is 55% off. This sweatshirt is on sale for $15 - great deal - available in several colors! This v-neck sweater is on sale for $6 (85% off)! These leopard mules with espadrille heels are a favorite of mine. This staple blazer is on sale for only $40. This white tote is 40% off and under $50. This is the cutest floral sundress that is on sale for $27. These fun polka dot mules are on sale. This linen cami is 40% off. 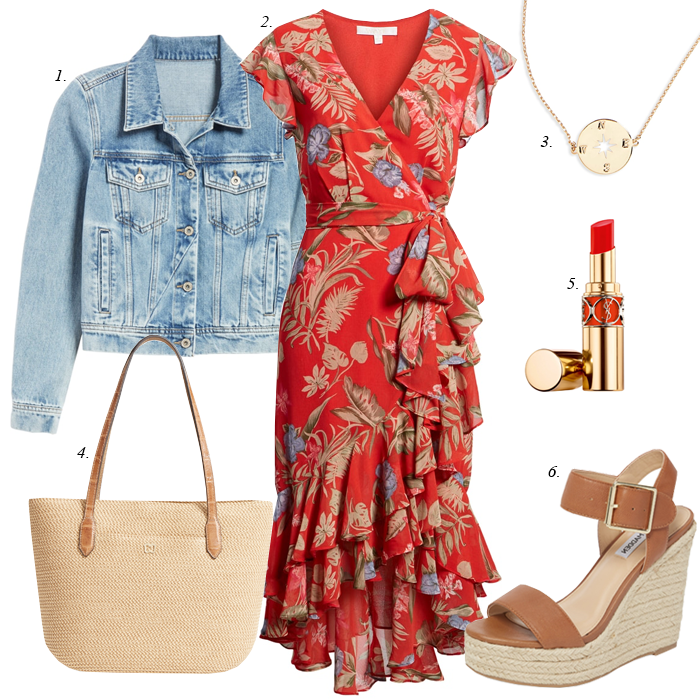 Ahhh that ruffle wrap dress has my heart! Just love it with the lighter denim jean jacket!! Seriously CUTE! Oh that wrap dress is FABULOUS!!! Love all of this! How perfect for summer!